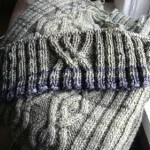 Now that work has slowed down a bit I’ve been able to think about knitting a little more. All these projects are mulling in my brain! Last night, one seemed to pop out more than others though, and I’m starting on it this morning. This idea is truly inspired by blog reading. If it were not for these blogs I would not have decided to make this sweater. First, Colleen made a sweater modeled after her favorite shirt. You can read all about it here, and a pic of the inspiration T is here. She did a great job of translating her T shirt measurements into a really well-fitting sweater. I loved the idea the moment she blogged about it. Doesn’t everyone have a favorite top that they’d love to clone? 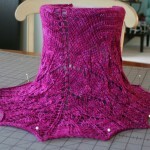 Then, Obsession du jour finished up her hourglass sweater. All I can say is WOW! It’s gorgeous. The shaping and fit is perfect. It’s my favorite hourglass I’ve seen so far. And finally, Grumperina finished her Tivoli t-shirt. The wider neck is a lot closer to my favorite T and the short sleeves are better for a project that should be quick (since I hear it’s almost summer, if only I could turn off my heat). And do I need to mention the perfect fit? I’m going to mimic my favorite T’s shaping, inspired by the hourglass’s finishing and Grumperina’s short sleeves and top-down approach. Truly a sweater from the blogs. Thanks, ladies, for some wonderful inspiration! Good look with your adventure. I hope to one day design for myself so I wish you all the best. Can’t wait to see the outcome. 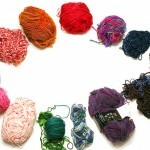 You’re right in saying there are many inspirational knitters out there! 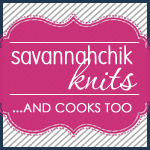 Good luck with making something that’s your favorite, fits well, and is quick and easy to do! We all need more projects like that, don’t we? This is very, very exciting! I look forward to reading about your progress. Awesome. I love shaping, and shaping a sweater just for you is even better. All we’re missing is a picture of the shirt in question, will you be posting it?